Fitness is a clean and Modern HTML Gym Fitness Template. 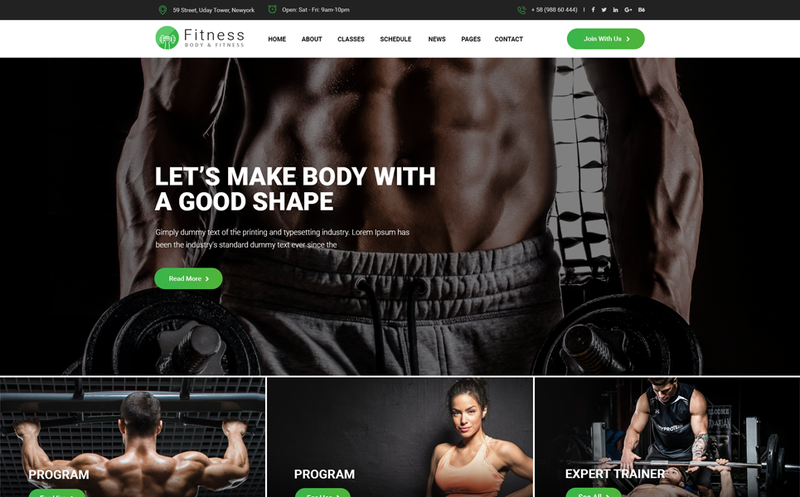 Fitness is suited for fitness center like Gym, Fitness website.This template included all necessary features like Service, trainer profile, testimonial etc. It will best choice for your Gym Fitness web site. Features List:Built Based on Bootstrap V 4Fully Responsive.Total 20 HTML Pages Included.02 Different Home pages ( Multi-Page ).18 different Inner Pages.AJAX Power Contact Form.Google Map with API Key.W3C Validated HTML5 & CSS3 Coding.Clean & Modern Design.Smooth Transition Effects.All Modern Browser Compatible [IE 11+, Firefox, Chrome, Opera and Safari]Well Commented Code.Font Awesome (350+ Icons).Google Web Font.Owl Carousel Slider.Nivo Slider.Easy Customizable and Flexible Elements.Extensive and Quick Support.